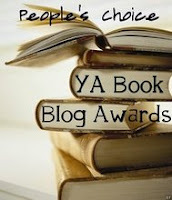 The fabulous Steph at Hey, Teenager of the Year has organized a people's choice blog award. The nominations are up and the voting has begun! Voting is open until May 15, so head on over to Hey, Teenager of the Year and cast your vote. I think this is a great idea, but it was really hard to vote because so many blogs I love were on the list. Wow, it is definitely down to the wire, huh? The best of luck. Hmmm... you bringing any books w/ you on your honeymoon. lol. Way to go on your nomination. Sweet. Congrats on the nomination. Congrats on the nomination! You deserve it. Hope you're having a terrific week and aren't sweating the small stuff. Enjoy your special day and everything about it. May it be a great start to many happy years and show us lots of photos!